Our blog might have been a tad silent this past month, but all around us people have been speaking up. 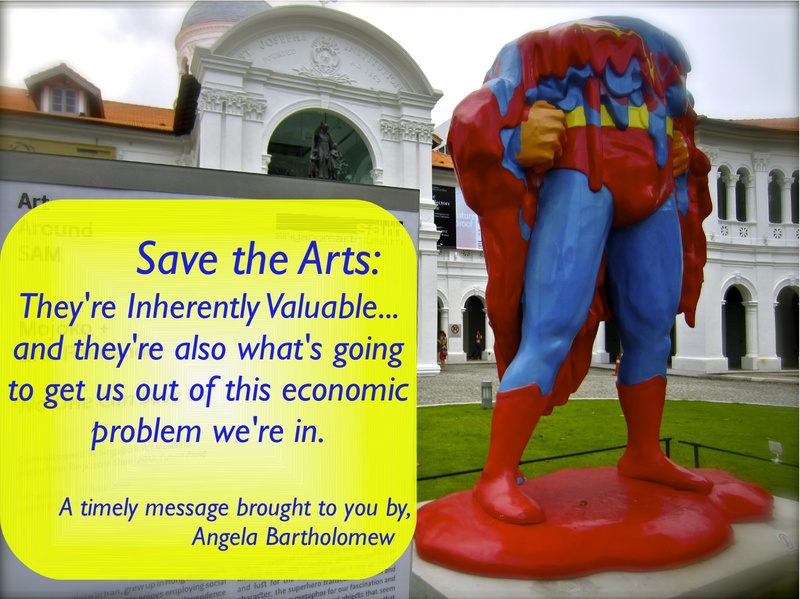 Speaking up, primarily, about the dire faith that seems to be coming down on the arts and art education. Sometimes, as in VAMA student Angela Bartholomew’s lecture, the message was crystal-clear; other points were made more implicitly. A short overview of what’s gone down this past month around VU University. From May 16 to 19, artist and researcher Jeremiah Day celebrated the 50th anniversary of Hannah Arendt’s Crisis for Culture. The 2011 50th anniversary had served as an occasion to take up Arendt’s text and elaborate upon it through a series of reading-sessions and talks held in London, Berlin and Amsterdam. This commemorative jubileum culminated in May with a gathering of participants and speakers from the previous sessions, including VAMA students Angela Bartholomew, Roel Griffioen, Svea Juergenson and Vincent van Velsen. The four-day conference/working session was aimed to break open new lines of thought in the relatively under-researched terrain connecting Hannah Arendt’s work and contemporary cultural practice. It was structured around three reading sessions, accompanied by discussions, two roundtables and several other tours and projects. If you want to know more about the specific themes and projects, you can check out the full programme on Goleb’s website. Update: On May 21, Angela Bartholomew added a post-script event to the conference. Her lecture, entitled Save the Arts: They’re inherently valuable…and they’re also what’s going to get us out of this economic problem we’re in came as an explicit response to the dire status of arts funding in the Netherlands and intended to bring the delusive expectations put on contemporary art into context. 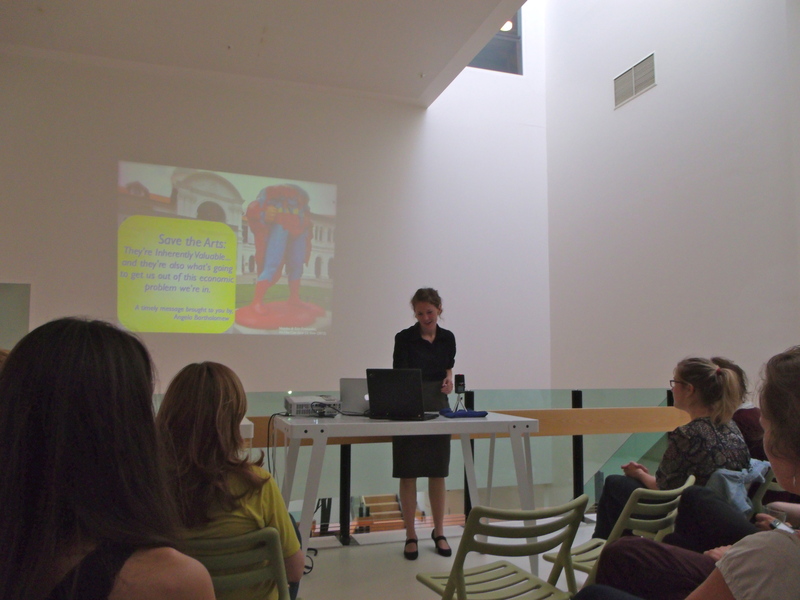 Taking the audience on an art odyssey, the lecture looked at various works of contemporary art in terms of their ‘benefit to society’ – benefits derived from claims made by the U.S. to defend arts funding in 1957 – and modified with arguments from recent discourse around ‘what art is’ and ‘who art is for’. The lecture aimed to spur discussion about what exactly it is about art that we want to save, and what we have already lost. The evening further coincided with the presentation of short publications from other VAMA students. Check out the original invitation to the event here or some of Angela’s photos in our Gallery. The next week, on May 29 and May 30, two esteemed members of our academic staff – Wouter Davidts and Jonneke Jobse – presented their respective farewell lectures. Both Davidts and Jobse will leave the VU at the end of this academic year and they thought it best to say goodbye to students, colleagues and alumni by presenting some of their personal research. We wish them all the best and hope to have some photographs of their lectures soon. Some pictures of this event can also be found in our gallery.